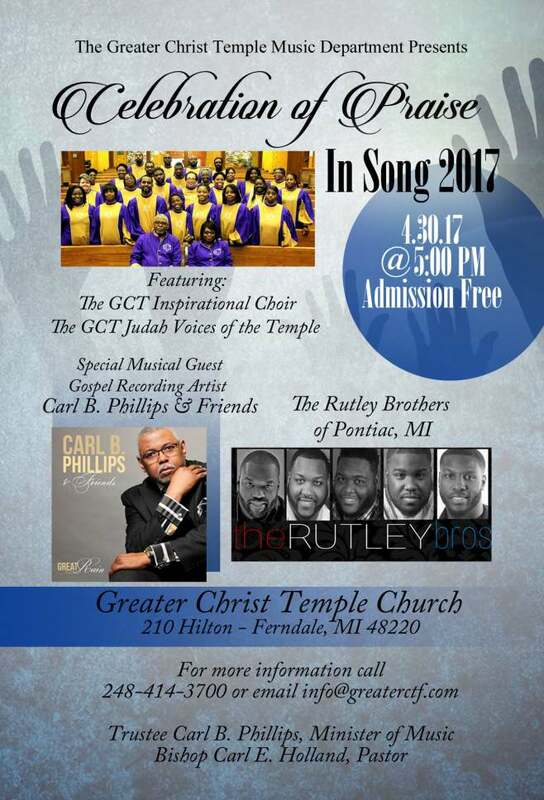 DETROIT - April 22, 2017 - PRLog -- Greater Christ Temple Church welcomes home Gospel Recording Artist, Carl B. Phillips and Friends for Celebration of Praise in Song on Sunday April 30, 2017, 5PM. The church is located at 210 Hilton in Ferndale, MI. Since releasing his debut CD "Great Rain" in 2016, Carl has traveled throughout the US with live performances in Los Angeles, Las Vegas, Nashville and Chicago. He's also appeared on the television shows TCT Live, Atlanta Live, and Dr. Bobby Jones Presents. Two singles from his CD, "I Know What God Did Last Summer" and "Meeting In The Air" charted on the Nielsen / BDS Top-500 Gospel Singles Chart, in addition he's been nominated for a Detroit Music Awards, the Rhythm of Gospel Awards, and the Independent Gospel Artist Radio Alliance Awards. For the past 40 years Carl has served in the Music Department of Greater Christ Temple in various capacities including his current role as Minister of Music. It is at Greater Christ Temple under the leadership of his pastor, Bishop Carl E. Holland; Carl developed and perfected his musical gifts. According to Carl, " I am excited to have an opportunity to share in a live performance at my home church the music that has afforded me an opportunity to fulfill my dream of being a recording artist."